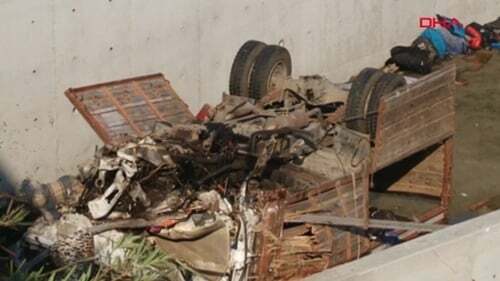 Twenty-two people, including children, have died after a truck carrying migrants crashed in the western Turkish province of Izmir, Turkish media has reported. The mangled wreckage of the open top truck laid toppled over in a canal, some 20 metres below a highway from which it apparently fell after crashing through a barrier, video and photos published by the Anadolu news agency. According to the Demiroren news agency (DHA), the truck passengers were foreign migrants who had reached a deal with traffickers to be transported by boat to the Greek island of Samos, off the coast south of Izmir. A state prosecutor has launched an investigation into the crash and the truck driver could face arrest after hospital treatment. Thirteen people were injured and taken by ambulance to nearby hospitals. Nine of those injured were children, DHA said. The truck driver lost control of the vehicle and it crashed at around 8am local time in the Gaziemir district, near the airport south of Izmir city, DHA said. One reporter at the scene said emergency workers had worked to retrieve the dead and wounded trapped beneath the truck.